Best place to find non-reflective button copy in the Northeast? I'll be going on a trip in the Northeast soon. CT, NY, PA. Any places where I can find some non-reflective button copy? Re: Best place to find non-reflective button copy in the Northeast? Still quite a bit of it left in New Jersey. 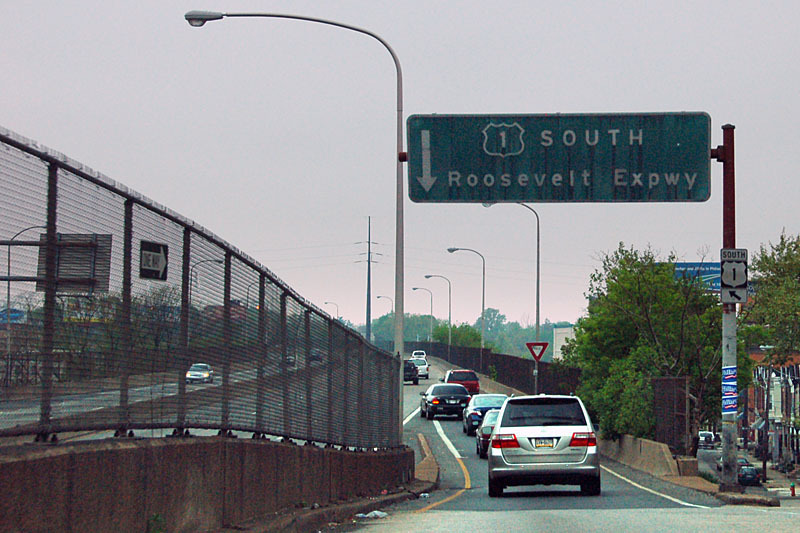 Passyunk Avenue west of Interstate 76 / Schuylkill Expressway in Philadelphia has several overheads. 2004 pics below, but GSV from 2012 shows that they are still in place. Used to be some in Vermont, as late as 2008 in Montpelier at the US 2/VT 12 junction...those signs are sadly gone, but there might be some vestigates leftover where there were Interstate connectors built. Possible places would be Barre, Newport, and St. Albans...I don't remember offhand if the overheads in those towns were button copy or not. They certainly weren't reflective. There's still an overhead on US 2 approaching US 302 on the east side of Montpelier, but I believe those signs were replaced. Last time I was on I-78 between the US 22 split and the New Jersey state line in the Allentown-Bethlehem area, there was lots of button copy. try this for something which predates button copy. I believe those are all beaded-Scotchlite reflective demountable foreground elements on a non-reflective background. Philly in general has some good stuff. I-278, Belt Parkway, FDR Drive in NYC - and isolated examples on several other NYC freeways, but those are the major ones that leap to mind. Roosevelt Blvd. in Philly (US 1), both directions, but a lot of them have been replaced by now. Woodhaven Blvd. (PA 63) signs were replaced on the mainline, but a couple of intersecting streets still have original signs. Then you have all of the side streets between I-95 Exits 21 and 26 along the river, on up to the area of the PA 73 interchange. At least 8-10 signs total for Delaware Expressway. The other bastion at East/West River Dr./Fairmount Park was replaced recently, I'm told. CT only has a couple, and those are posted in the Northeast group here. NJ has a few left on I-78 in the Exit 30-48 stretch (ish). NJ 3's old signs are gone. Pulaski Skyway and US 1/9 from the airport on north still have them. That's about it, we mostly have the reflective back variety. This may be an old page, but I spotted something showing button copy in Staten Island, specifically on a concrete wall at the Richmond Valley Staten Island Railroad Station. There are a few front lit button copy signs on i-81 in VA. Seriously? Where? There used to be a lot of button copy in West Virginia along I-81, and WV tends to illuminate its overheads, but all of the signage on I-81 in WV had been replaced a few years ago. To my knowledge the only button copy ever used in Virginia was on VA 76 between VA 146 and the first toll booth south of the James River. These were not VDOT issued. Virginia had de-mountable copy, of which exceedingly few examples remain. The well-known examples in Fredericksburg with all 4 shields technically incorrect for decades is still up.